We were at a Flea Market a couple of weekends ago when we saw this musty old wooden box. 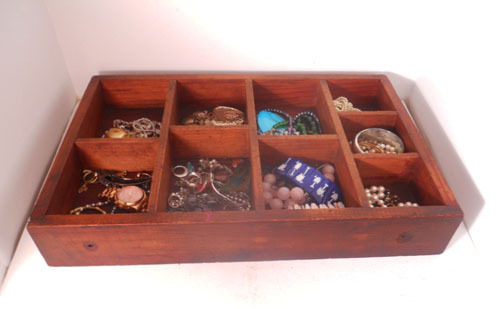 It had divided compartments and two holes on one of the sides that made us think it used to be a desk drawer. 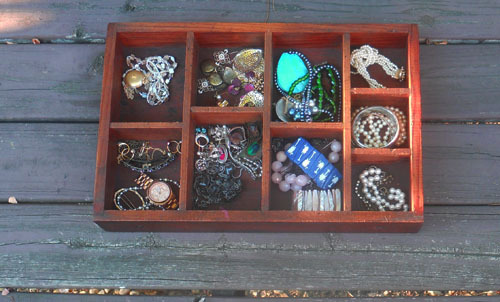 When I saw it, I immediately knew it could be used to organize the pile of jewelry that was just sitting in my closet shelf. Don’t judge. You know you have a jewelry clump somewhere. The wood was looking very worn, so my boyfriend took some Howard Restor-a-Finish to it. The following is his tutorial. Step 1: Stop by Home Depot, go towards the paint section and find any person over fifty for help. I hate to be age discriminatory but older Home Depot employees are always better than younger employees. It is a fact. Say I need “Howard’s Restore-A-Finish.” If they look confused, add, “It’s like a stain but not…” They’ll know where to find it. Pick the color that matches what you think the original color of the item was. Oak is for darker. Walnut for lighter. Don’t try to change the color of your wood item, it won’t work, you’ll be sad, you’ll be that guy (or gal). Step 2: While at Home Depot, buy a package of steel-wool. Stick with your old person, do not let another customer swoop in and take your old person. You’ve earned your old Home Depot employee – he or she is yours until completion of buying. Step 3: If you care about your nails or hands buy rubber surgical gloves. Again, your old person should know where they are. Step 4: Check out in the “Self Check-Out” aisle…everything at Home Depot has a bar code. Fact. Step 5: So you have your wood item that you’re going to restore in front of you, right? RIGHT!?! Calm down. Now, take the Howard’s liquid and put the clump of steel wool on the top of the bottle, turn the bottle over so the steel wool gets moist with the liquid. Oh, yeah, if you care about your nails/hands, you should have put on those gloves. If you don’t give an F, carry on…it will wash off people, it’s not the plague. Step 6: Press your steel wool against the wood and rub WITH the grain of the wood, making the wood wet with Howards’ liquid. If you don’t know what the grain of the wood is then rub an ungloved finger up and down the wood – with the grain will be smoother, against the grain (insert sad face emoticon, bloggers love that) will have a slight grind to it. Rub with the grain so it’s smooth. If you truly can’t tell, and I’m not being condescending because sometimes it’s near impossible to tell, then make small smooth circles with the liquid and your wool. If there are little paint splatters on your item and you want them gone, press harder and use that wool like sandpaper. Step 8: After you’ve done the entire wooded item (with la grain) take a clean, dry paper towel and wipe the entire item down. If you want to go back and touch up some spots, go for it but again don’t let the liquid settle for too long. Step 9: Let the item sit for awhile to truly dry. If your item is a chair and you insist on sitting in it immediately, I’d recommend waiting until after Labor Day…white pants/brown bottom equals jokes about your white pants/brown bottom. Step 10: Put it somewhere you will see everyday and think of your old friend from Home Depot. That’s it! Here it is in my closet shelf looking brand new again.